The town of Lonaconing was incorporated in 1890. Sandra K. Wilt is a long-term member of the Lonaconing Town Council, having served in that office from June 1989 to the present, a total of 21 years thus far. She currently holds the position of Police Commissioner on the town council and at this writing is about half-way through her current two-year elected term of office which expires in 2013. 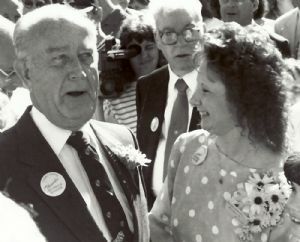 The photograph above depicts Maryland Governor William Donald Schaefer and Lonaconing Town Councilwoman Sandra K. Wilt. Councilwoman Wilt is seen updating the Governor during a site-visit to the town on the progress being made after a major fire hit the downtown area on May 9, 1990. Sandra Wilt declined to run for re-election in 2013.